Experience an unforgettable evening cycling in Paris when it is all lit up and enjoy a fantastic Seine river cruise. The bike tour will start close to the Eiffel Tower. You will be riding through the Latin Quarter and discover the dynamic nightlife in town. 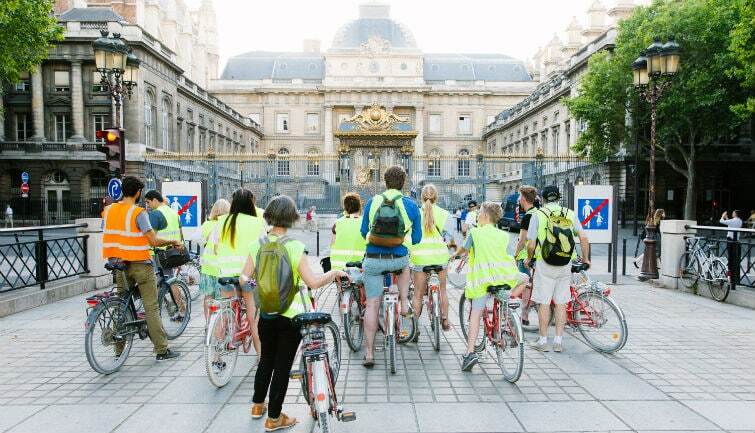 You will also bike along the Seine River towards Notre-Dame Cathedral on the Ile de la Cité and appreciate a delicious ice cream at Berthillon (the most famous ice cream shop in Paris). Cross over the Pont des Arts Bridge, admire the sun setting on the roofs of Paris and enjoy a nice view over the illuminated Louvre museum. Embark on a boat to enjoy a relaxing cruise while tasting wine on board. 63 Blvd de Grenelle, 75015.